After an excellent festive period in the league, attention now turns towards “the Road to Wembley”. There I’ve said it now. It’s out of the way for the moment, although Hereford have reached the last 32, and it’s beginning to get interesting. Especially as the Bulls now face the holders of the competition – Brackley Town – at Edgar Street next Saturday. So why not pop along and give the team your support. Unbeaten at home in six matches, including 5 wins in the process, home form has greatly improved. But what of the visitors? Here is the Talking Bull Preview. Good draw. Not only are we at home again – our third time this season – we are up against the Cup-holders who aren’t having that great a season. And should it happen, a replay won’t mean contacting the flat earth society first to see whether it is safe to travel. We Black Country Bulls can get to Brackley more quickly than we can the Street. Given our extended dodgy patch this term, pleasing that Hereford FC are still in a national Cup competition in January. Is this Cup run helpful or not helpful? Debatable. I was opposed to a Trophy run last year because we ended up with a bunch of long distance away trips in midweek but we got away with it because of the quality of our squad. This season, I know that our visit to York is now midweek but maybe our current team need the extra confidence that winning Cup matches can bring? A victory puts us in the last 16 and we can dare to dream. Worth commentating that the best Non-League sides no longer win the FA Trophy. To be truthful, many of them gave up trying years ago. It gets in the way of promotion challenges. The 2017 winners were York City who’d just been relegated to Step 2. In 2016, when we were the star name at Wembley, Halifax won the Trophy and they’d also just been relegated. The Year before, Step 2 North Ferriby lifted the trophy. Their manager conceded that winning the Cup led them to finishing only in mid-table due to fixture congestion. Their beaten opponents Wrexham sacked their manager Kevin Wilkin the next day. The last time a promotion winning side also won the Trophy was Cambridge in 2014. So the dream factor, especially in our League which has won 2 of the last 4 tournaments is still alive. I wonder how many of our supporters would accept relegation in exchange for another visit to Wembley? Brackley, for anyone who doesn’t know, is a small town on the edge of Northamptonshire. Population is about 15,000 but growing. My best memory of my last visit was that one of their local charity shops doing an excellent line in new wool blankets. I mention that purely because I bought two of them before our League match in September. It is remarkable what can be picked up at or near a football ground. Remember all those football books at Bradford with brackets? 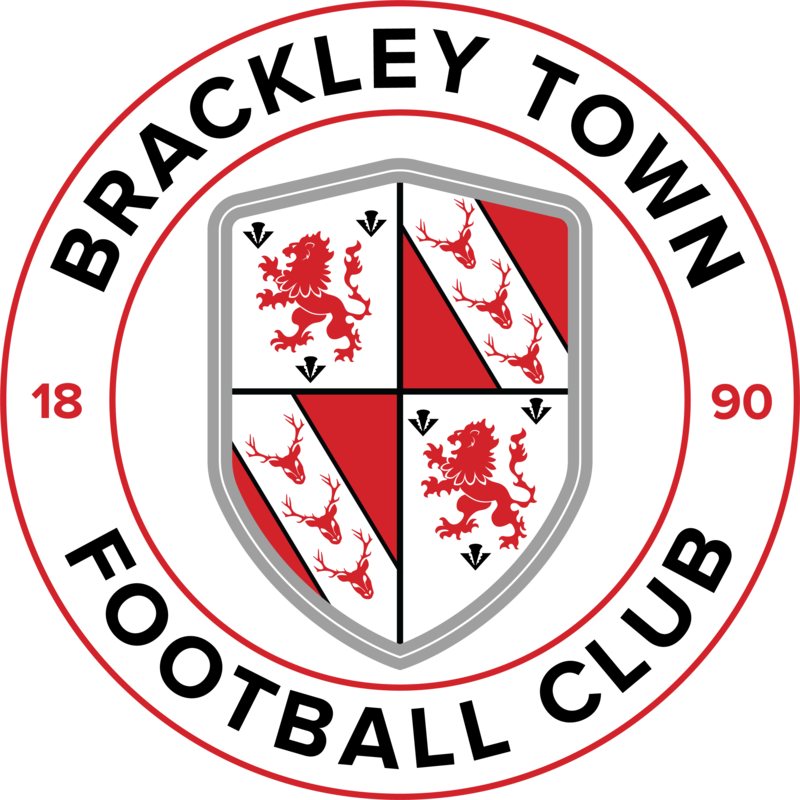 Brackley are new to the football map. For most of their life, they defined obscurity. Only when former Hereford United midfielder Jon Brady became manager in 2008, did the club start going places. This is their sixth season at Step 2 and last years third place finish was the highest in club history. Our visitors have conceded goals in every away League game this season. Even we’ve kept a couple of clean sheets on the road. Bit of a contrast to last season when Brackley had the best defence in the Division (37 conceded in 42 games). This season they had let in 31 by the end of 2018. However, despite being a bit leaky, they have wins at Nuneaton, Boston and Ashton plus 4 draws to boast about. As they may point out, the Reds haven’t lost to a struggling Step 2 side this season. In the League, they are currently a few points short of the Play Offs spots. Prior to the last game of 2018, they’d gone 7 League games without a win. Fortunately, they were home to Nuneaton on Dec 29, which is the nearest you get to a “Gimme” at this level and they duly beat the Warwicks club 3-1. Obviously, they have won Trophy matches – beating Nuneaton and Hayes & Yeading. Incidentally, Brackley also drew Nuneaton in the FA Cup which went to a replay so the two sides have met 5 times in 5 months. Brackley won four of them. Last season, the Reds finished third in the League and battled through to the Play-Off Final where they were well -beaten by full timers Harrogate Town. That’s on top of winning the FA Trophy Final on penalties against Bromley. Brackley were losing as the game moved into injury time before a Bromley defender Roger Johnson scored an own goal. How lucky is that? Maybe that is payback for Bromley for taking on a player with a notorious past. He is well remembered in the Black Country. The Dingles gave Blues £4 million for his signature and he was such a disaster they later gave Johnson a free transfer. In between, he infamously once turned up drunk for training. Cue obvious jokes. There is a wider point here that including 3 replays and the double-legged Semi. Brackley played 11 Trophy games. Heck of a lot of extra fixtures for a part-time club. They were lucky with the draw, only having to play one full-time team in Salford who weren’t at all interested. Since Wembley, Brackley have lost a few players to higher clubs including their top scorer Williams to Harrogate. Others retired. The club have struggled to replace all that talent and the esprit de corps. Among the departees was Luke Graham, now player coach at Kettering who was weary of always being a substitute at Brackley. 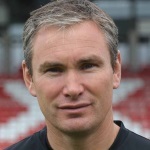 Manager Kevin Wilkin is a former pro footballer, mainly with Northampton. Joined Brackley over 3 years ago. Before then, he took Wrexham to the Trophy Final and also managed Nuneaton for 6 years. Wilkin only has one assistant to help him and no specialist coaches. Drew a blank on Wilkin’s day job but I did find out that he relaxes by mucking out his horses or to re-use his own phrase “cleaning out the crap”. The assumption remains that the club he manages are bankrolled by their wealthy co-owner though if that is the case, he’s doing so very discreetly. Hard to see how a part time club in a small town with attendances of 560, even with cheap admission, can compete otherwise. Just a soupcon about the visitors’ squad, bearing in mind they return next month for a League game, so I will need something new to say then. Recent arrivals include McAlinden, 25, 6 foot tall striker on loan from Cheltenham and Sam Finch, a midfielder on loan from neighbours Banbury. McAlinden scored against Nuneaton. Brackley’s regular central defender Conor Hall was carried off against Nuneaton. Looked like a serious knee injury so he may not play against us. Lee Ndlovu is joint top scorer with 11. Lee is a big, mobile central striker, their Symo with pace if you like. Behind him, James Armson also has 11 goals from midfield. Interesting guy Armson. During the day, he owns a business which supports children with behavioural problems. Now, that is a proper job. When we visited Brackley, Armson gave them the lead and Ndlovu scored the second in what was a really bad day at the office for Hereford. Richards and Dinsley were both sent off during the dying days of Peter Beadles reign. Only 3 of Hereford’s starting line-up on that day are still regular starters so our last game should have little in common with the League fixture. So that concludes my review other than a reminder that any remaining copies of the shiny, new Talking Bull will be on sale. Bring on Brackley.